A4 Art Australia 2018 is now open! 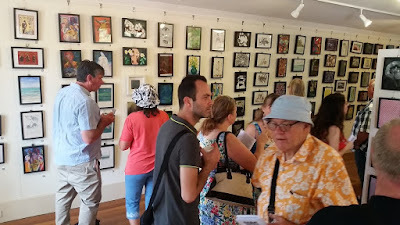 The opening of the fifth annual A4 Art Australia was on Saturday 17 MARCH between 12 noon and 2pm at the Herring Island Gallery. The exhibition celebrates the diversity of contemporary art produced by artists from all across Australia. All 133 participating artists have contributed to the wonderful and imaginative spread of over 400 very affordable artworks in our show. The exhibition is on show the following dates: 17, 18, 24, 25, 31 MARCH 1, 2, 7, 8, 14, 15 APRIL (2018) NOTE: The gallery will also be open Easter Monday 2 April. Bring your friends/family to the show! The exhibition was opened by Cr. Glen Attwell representing The City of Stonnington. There are 401 distinctive A4-sized artworks and sculptures on show, covering almost every imaginable subject, and created in a wide range of media including - acrylic, aquatint, charcoal, collage, crayon, digital print, enamel, etching, gouache, graphite, ink, linocut, mixed media, oil pastel, pastel, pen, pencil, photography, polymer, textile & watercolour!